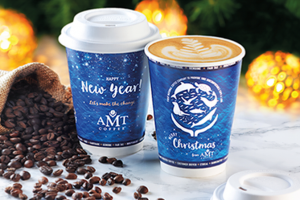 Dunkin’ Donuts is thanking its guests and local communities by brewing a little extra joy for the holiday season with free coffee through its “Brewing Joy” programme. On weekdays between 1 December and 20 December, at least one Dunkin’ Donuts restaurant somewhere in the US will serve up to 500 free medium-sized cups of its signature hot coffee. 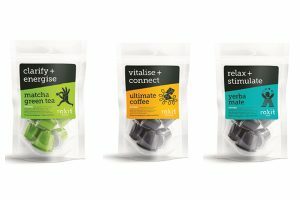 First introduced in 2016, Dunkin’ Donuts is bringing the “Brewing Joy” program to approximately 40 Dunkin’ Donuts restaurants in December this year. Additionally, in each market where a Dunkin’ Donuts restaurant is “Brewing Joy” with free coffee, area franchisees will donate USD $1,000 to a local organisation aligned with the Joy in Childhood Foundation’s mission to bring joy to children whose lives are affected by health issues or hunger. In total, Dunkin’ Donuts franchisees will donate more than $25,000 to local organisations through the “Brewing Joy” program. The “Brewing Joy” programme kicks off today, 1 December, at a Dunkin’ Donuts restaurant in Mount Joy, Pennsylvania. The full schedule of participating Dunkin’ Donuts locations hosting “Brewing Joy” events can be found on the brand’s blog. Additionally, now through the end of the year, Dunkin’ Donuts’ signature Hot Chocolate is available for only USD $1.99 for a medium or larger sized cup (excluding vanilla chai). 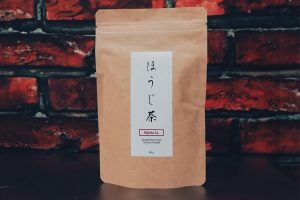 Dunkin’ Donuts’ packaged coffee is also available at participating Dunkin’ Donuts restaurants nationwide for the special price of three pounds for $19.99 (plus taxes). For coffee lovers, Dunkin’ Donuts’ returning holiday flavours include Peppermint Mocha and Brown Sugar Cinnamon. Both coffee flavours are available for a limited time hot or iced, including lattes, macchiatos and Frozen Dunkin’ Coffee. 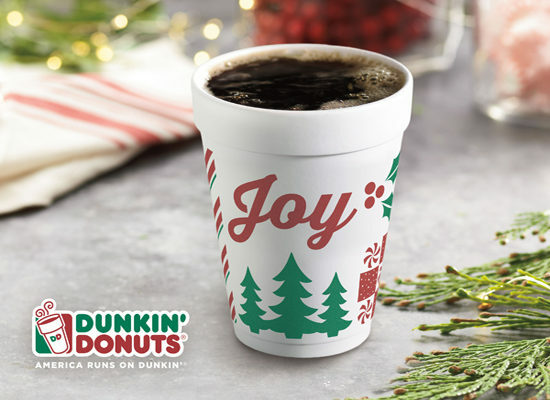 This holiday season, Dunkin’ cups once again feature a festive design and the simple word, “Joy” to convey the happiness and spirit of the season.